A great party calls for fabulous food and drink. Impress your guests with unique interactive stations, creative small plates, and signature cocktails. You’ll be inspired by these 50 fun and innovative menu ideas. 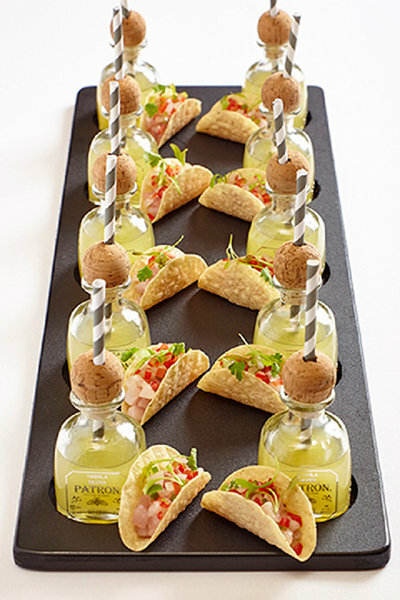 Trending: stylish mini appetizer and drink pairings, like these mini Patron margaritas with taco bites. Another fun mini-pairing: hot dogs and beer. This clever fork display features one-bite cheese pairings like camembert and jalapeño, manchego and fig, and blue cheese with cranberry and walnut. A gorgeous cheese wheel wedding cake is embellished with fresh flowers and succulents. Calligraphy tags label each cheese selection. Who doesn’t love melty grilled cheese? Try this mini comfort food accompanied by tomato soup shooters. Novel green tomato gazpacho shooters are topped with toasted almonds and micro cilantro. Ahi tuna tartare gets an elegant presentation in a crisp cone, with sriracha, mango, and lime-avocado cream. Spaghetti and meatballs go upscale for a clever and tasty one-bite appetizer. Everything is better on a stick! Freshly-grilled chicken yakitori, lamb, and falafel skewers are served with a variety of dipping sauces. A unique multi-tiered wedding tart is artfully adorned with seasonal fresh fruit and flowers. A delightful and functional display idea from Simple Bites: present your outdoor buffet in an old canoe, accented with pretty wildflowers. Offer healthy avocado halves with an assortment of tasty toppings, like shrimp ceviche, fresh salsa, and flavored salts. Impress your guests with an innovative interactive experience: an olive oil tasting station. A winter wedding calls for a hot chocolate bar, made special with a selection of peppermint and chocolate toppings and extras like caramel drizzle and sea salt. A salad course served in this striking display is lovely for an summer outdoor meal. Calling all French fry lovers! Handmade signage provides a rustic display. There’s something for everyone when you offer a variety of fresh-baked pies. Decorate individual pie slice boxes with ribbon or rustic twine for a pretty and practical serving idea. Show some hometown pride with well-loved treats. Guests of these Philadelphia natives experienced authentic Philly cheesesteaks. Photo Credit: Onelove Photography via Jay's Catering Co.
An outdoor New England celebration features a traditional Martha’s Vineyard clambake by The Kitchen Porch. Top off your seaside dinner with these amazing decorated cookies from Sweet Ambs. This Tuscan-inspired wedding featured a lavish pizza buffet. Recall your Italian grandma’s Sunday dinner with this pasta and meatball snack. Honor your cultural heritage with a special dish like this bibimbap, a signature Korean rice bowl. All you need is love and churros. A towering display of colorful French macarons — over 200 in 10 tiers! — is a trendy wedding cake alternative. Dana's Bakery offers fun flavors like cookie dough and fruity cereal. Pretty in pink cotton candy martinis are a fun signature cocktail. Favorite sweet s’mores get a tasty upgrade with homemade graham crackers and artisanal marshmallows. Imagine your charming shabby-chic dessert display with these edible sugar doilies. Try something new: a mobile gelato bar, bringing amazing flavors like Tiramisu, Strawberry Fresca, and Salted Caramel. Yum! Get in on the craft beer craze with beer tasting flights. Set up a stylish Italian soda bar with a variety of fruity flavors. Don’t forget the whipped cream! Display your creativity with signature drinks and DIY this customizable and printable cocktail menu. Go for ultra-trendy with a siphon soup station. Give cake pops a glittery makeover for a glamorous addition to a dessert table. Stylish chalkboard décor inspires the dessert table with chalkboard wedding cookies. No one will miss the cake when you serve up funnel cakes and sweet toppings. Salty soft pretzels with honey mustard and beer cheese adorn a delightful display by Layered Vintage. Watch your guests dig into this lavish nacho bar. Margarita, anyone? A macaroni and cheese station, complete with toppings, is comfort food at its best. PB & J gets a style upgrade with glazed jalapeno bacon. After a night of dancing and partying, a delish deli sandwich is a perfect late night snack. What groom wouldn’t go wild for this “Man Cave” station, featuring cheese and pepperoni calzones and buffalo wings? Treat all-night partiers to an amazing breakfast sandwich: egg, cheese, and New Jersey’s own Trenton pork roll. The sweets table gets special treatment in this backyard wedding with a vintage carnival theme. Everybody’s favorite hot dogs can come right to you in a fun hot dog cart. DIY a rustic popcorn bar with downloadable chalkboard signage from Pen & Paper Flowers. Childhood favorite rice krispie treats are transformed with a charming design by The Cookie Star. Watermelon on a stick is a simple and refreshing idea for an outdoor summer celebration. Assemble mason jars and all the fixings for a fun interactive trail mix buffet. Cool off with a rainbow of frosty snow cones.